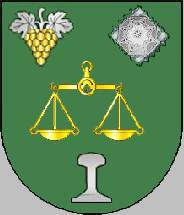 Shield Vert, a pair of scales Or, in chief a grapevine Or leaved Argent at dexter and an open-worked handkerchief Argent (placed like a squarish rhomb). In base a railway profile Argent. Mural crown Argent with three visible towers (village rank) and white scroll with inscription in black capitals "CARREIRA - BARCELOS"
Carreira Commune was one of the pre-2013 communes of Barcelos Municipality; it had 1451 inhabitants in 2011 and covered 3.2 km². Shield Argent, a keyhole Azure charged with nine barrulets wavy Argent, in chief a cross patty Gules, charged with a Greek cross Argent. Mural crown Argent with three visible towers (village rank) and white scroll with inscription in black capitals "FONTE COBERTA - BARCELOS". The cross is alluding to the Order of the Knights of Christ. The keyhole can be also described as follows: a heraldic fountain emerging to base as an isosceles trinagle. The keyhole is canting, because the name of the commune means "covered fountain" or "protected fountain" or "hidden fountain". The water can be seen only through a keyhole. Fonte Coberta Commune was one of the pre-2013 communes of Barcelos Municipality; it had 582 inhabitants in 2011 and covered 2.1 km².